But when the list of servers is large, you need to connect with various accounts, quickly switch from console to console, and using this method becomes inconvenient. 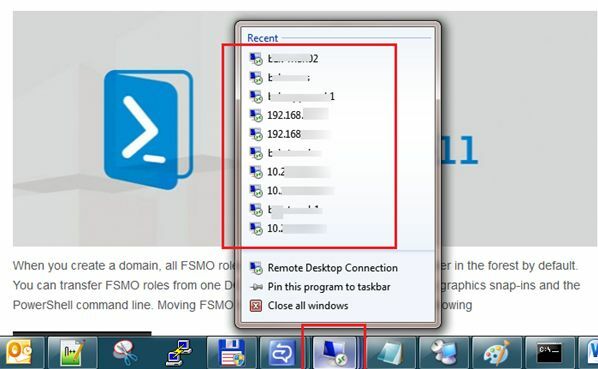 To solve this inconvenience (and to systematize connections to remote desktops) you should use the official utility from Microsoft — Remote Desktop Connection Manager (RDCMan). RDCMan is designed to replace the outdated Remote Desktops snap-in. 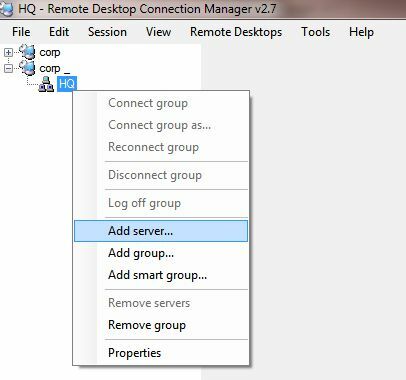 At the moment, the latest version of the program is Remote Desktop Connection Manager 2.7. 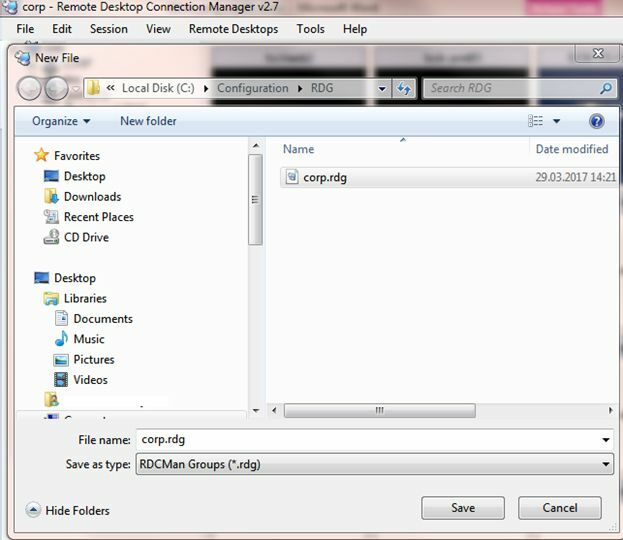 You can download RDCMan latest version from the Microsoft website RDCMan 2.7. Support for administrative connection (similar to/console and /admin switch of mstsc.exe utility). RDCMan is small in size, does not require complicated configuration, it is simple and easy to use. Installation of the program does not cause special difficulties. RDCMan is supported by all versions of server operating systems, starting with Microsoft Windows Server 2008 and client OS, starting with Windows Vista. In Windows Server 2003 and Windows XP, you need to upgrade RDP client to version 6.0 (or higher). How to Manage Multiple RPD sessions via RDCMan? After installing the RDCMan, create a configuration file. This file will contain all the settings and we will run it to access our tree of the created servers and workstations. To create a configuration file, go to the File menu and select New. You can create different groups of servers and workstations, and specify specific settings for each group (authorization, appearance, bandwidth etc.). 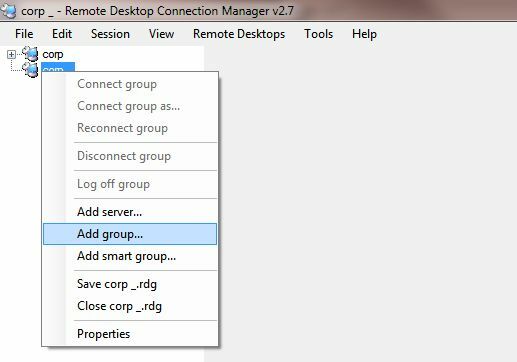 To create a new group, select the created configuration (in this case it’s name Corp), open its properties and select Add group. A large number of options are available in the settings window that appears. Specify the name of the group (HQ). 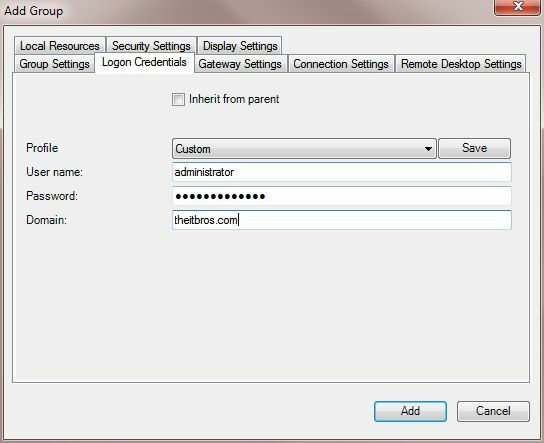 On the Logon Credentials tab specify the name, password and user domain under which you will log on to all machines in this group. In our case, this will be the Administrator of the theitbros domain. The active Inherit from parent option allows you to take settings not in the group itself, but in the directory above. If you uncheck the box, then you have to set the settings of this group separately. In the following tabs, you can change the display settings, set up the gateway, change ports, redirect options etc. 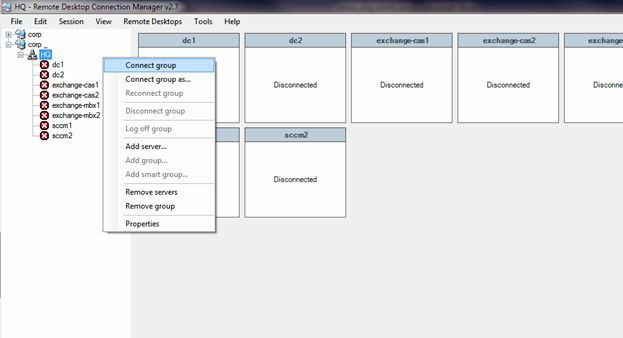 After creating the group, you should add the servers to it, only now we select the group as the object in which we will create the servers. The created server will take all the settings from the group HQ. Connect to the whole group at once by clicking on its name and selecting Connect Group. On the right pane, a small desktop image will appear. 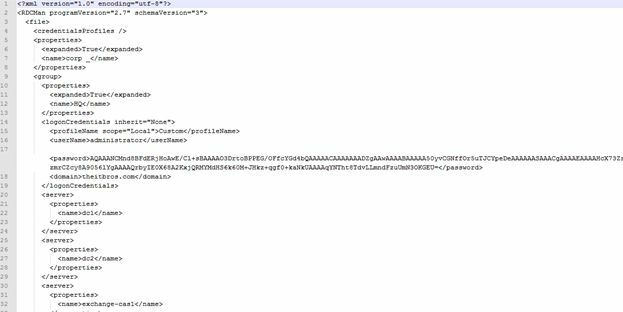 The configuration file is a plain text document with the extension *.rdg, formatted in XML and therefore available for manual editing. 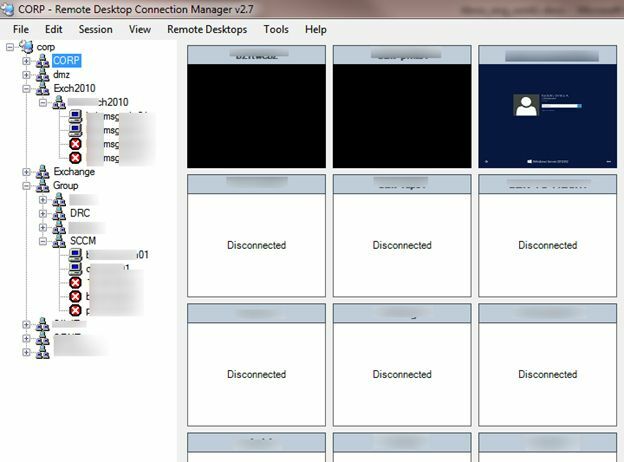 In conclusion, Remote Desktop Connection Manager connects with a single mouse click almost instantly, which greatly facilitates the simultaneous administration of multiple servers. RDCMan is one of the essential free utilities from Microsoft, allowing you to easily manage multiple RDP sessions. Here is another one great tutorial on how to access Hyper-V Virtual Machine console using RDCMan, it also can be useful for you. How do I run my connection in admin mode (/admin switch when using mstsc.exe)? Do you know if it is possible to auto connect server or group on startup?